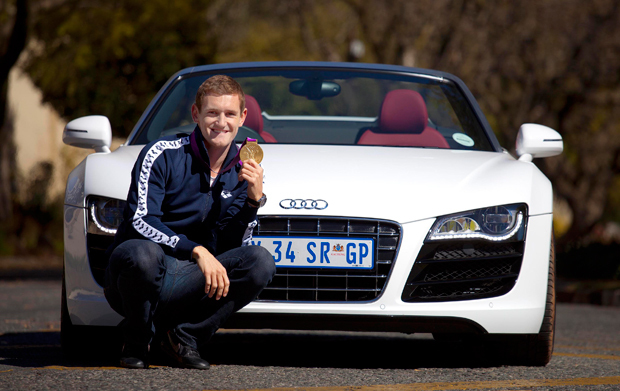 Johannesburg - Not only is he quick in the water, but South Africa’s London Olympics gold medalist, Cameron van der Burgh, now has a set of wheels to match: an Audi R8 V10 Spyder. The breathtaking car, valued at R2.3 million complements his enduring personal style as a trendsetter. Cameron received an Audi A5 earlier this year, but due to his heroics in London, Audi SA has surprised him with the top of the range Audi R8 V10 Spyder to drive for a few weeks, before placing an Audi RS5 Coupé as his permanent vehicle. “Audi SA is very proud of Cameron’s achievements and our longstanding relationship has enabled us to reward him in the best possible way”, said Ryan Searle, Head of Audi South Africa. As an Audi ambassador for the past two years, Cameron has been living the spirit of Vorsprung and the sky is the limit for this national hero. Van der Burgh won SA's first gold medal in London when he triumphed - in record time - in the men's 100m breaststoke.